If you have any questions or want to enquire about dates, use our form to contact Tamar Welti. Bask on terraces in sun or shade; slip into a pool whose plants keep the water pure. This serene eco house, awash with light, has been built in the local style. 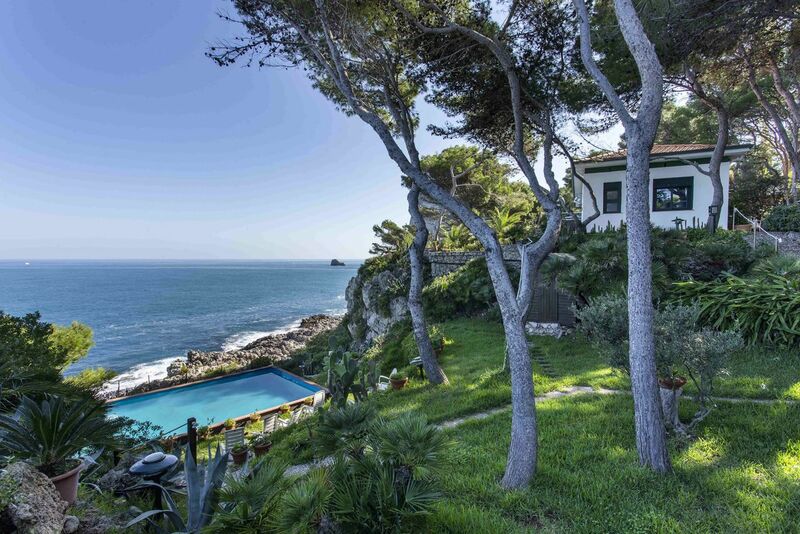 It stands on a small hilltop near pastures and newish houses, and the view from the roof terrace is 360 degrees. This is the edge of the amazing Ria Formosa, a series of lagoons teeming with wildlife, protected by islands of white sands. Catch the ferry from Olhão to the Ilha da Culatra and spend the day on a wild stretch of coast. You could chill out by the funky beach bar at the Farol end. Hop in the car for pretty Moncarapacho (4km) to experience real Algarve cuisine. For seafood there’s the fishing town of Fuzeta (14km); catch the little ferry to Fuzeta beach. Browse the fish market of old Olhão (5km), a popular port with a wonderful Moorish feel. Minimum stay: 7 nights. Pets by arrangement. 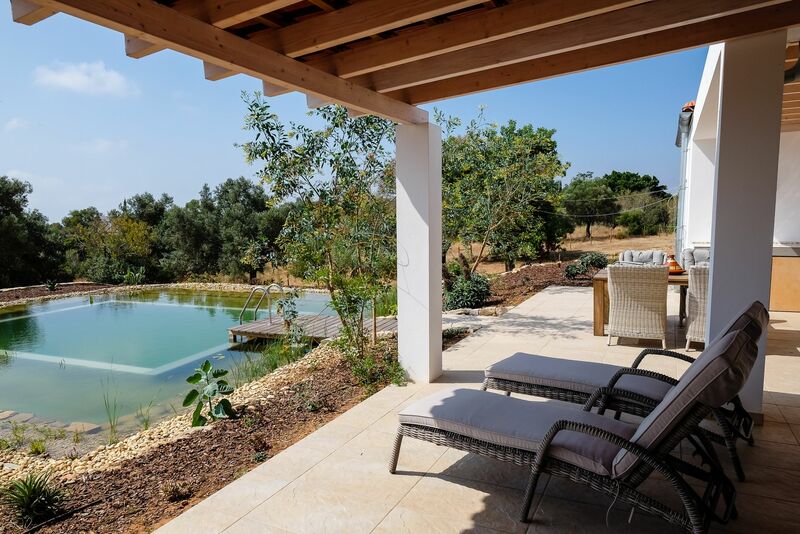 A very comfortable, modern and tastefully decorated hill top house, that overlooks the rolling hills down to the Algarve coast. 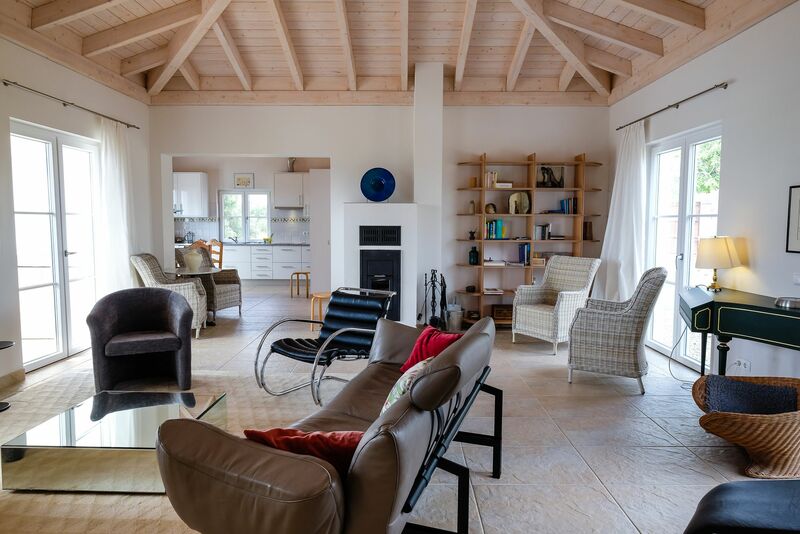 Perfect for those who just want to relax in a house that is uncomplicated but has been built to the highest technical specifications. Especially attractive for those with mobility problems or chemical allergies given it is an authentic and certified eco construction. 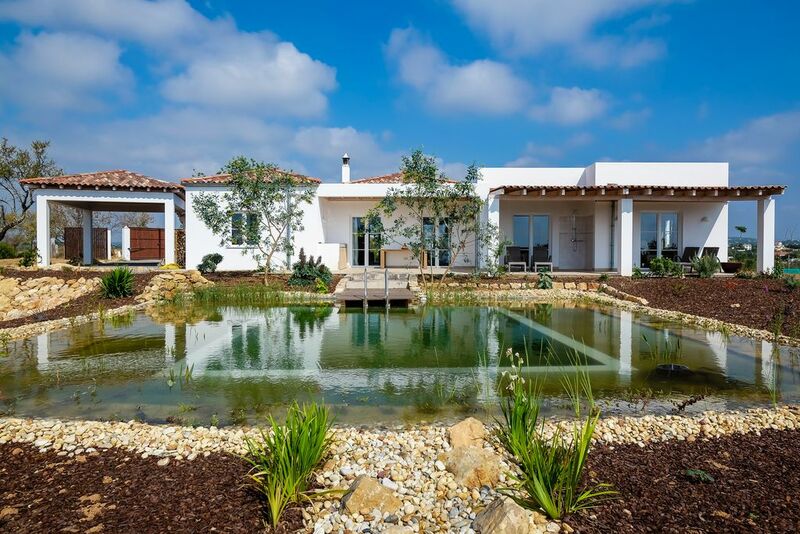 The house lies between the villages of Quelfes and Laranjeiro, in a semi-rural area with a backdrop of rolling hills. The closest market town is Olhão (5km) and beyond is the unique Formosa Natural Park, with its tidal salt marshes and often deserted beaches. For a change of scene the Spanish border is a half-hour drive; visit the dazzling white river port of Ayamonte, and the beaches Canela and Moral, 7km south. The nearest town of Moncarapacho is a small inland rural town comprising several cafes with esplanades, some good and inexpensive restaurants, schools and small shops and residential streets which exude a calm, unhurried atmosphere. Olhão is a busy, authentic modern town with an architectural patchwork of canning factories, warehouses and traditional fishing houses converted into bustling restaurants along the gardened and pedestrianised waterfront. The Ria Formosa Natural Park is of particular wetland importance to bird life: as a breeding ground for many species, as a wintering ground for many birds from northern Europe, as a resting and feeding station for birds migrating between Africa and Europe.